ICSC study reveals store traffic was higher than last year. NEW YORK —Black Friday lived up to its reputation as the busiest shopping day of the year, according to the International Council of Shopping Centers, which estimates that about 151 million people visited a mall or shopping center over the weekend. The ICSC’s estimate of Black Friday traffic was based on an online survey conducted on Saturday, November 24. The survey, conducted by Engine Insights on behalf of ICSC, polled a a demographically representative sample of 1,007 U.S. adults. The survey found that omnichannel retailers — those with both a physical and an online presence — were the preferred destination for holiday shoppers, capturing 88% of spending on Thanksgiving Day and Black Friday. Among those consumers who used click-and-collect services (27% of Thanksgiving Day and Black Friday shoppers), 64% made an additional in-store purchase. The Halo Effect will also be a major influence this Cyber Monday, as 80% of shoppers surveyed say they plan to purchase from omnichannel brands. 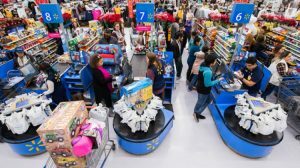 Walmart U.S. chief merchandising officer Steve Bratspies said in a statement that Walmart was pleased with the traffic in its stores on Black Friday.